They say the Gotham City comes alive at night, and what better way to clown around town than in the back of a flat black taxicab, as set photos from the upcoming Batman V Superman: Dawn of Justice film reveal. Taxicabs have been painted yellow almost since inception, the yellow meant to stand out on the streets and attract more customers. 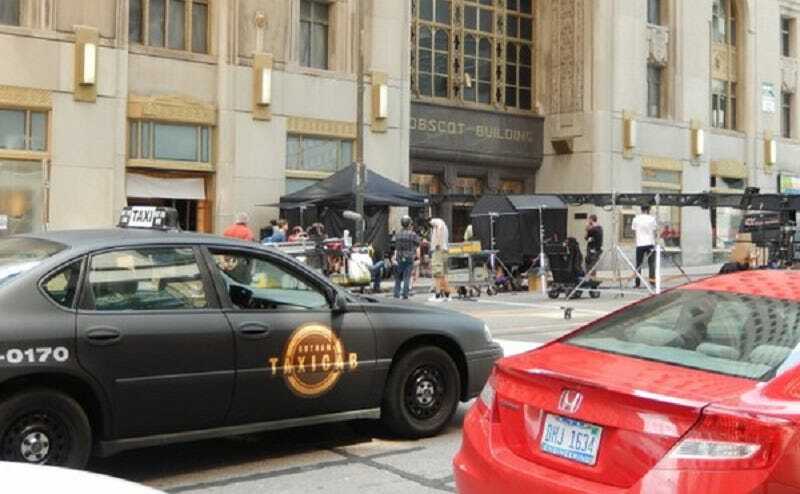 However it should be obvious that the citizens of Gotham City want to do everything they can not to draw attention to themselves, and the black taxis spotted on set and posted to Twitter by BiASED Jaun further prove that point. The photos are actually for the pair of Turkish Airlines Superbowl ads that showed a Gotham city “rising above its past” with a cameo from Bruce Wayne himself. There’s also a very interesting convertible Ford Econoline van with “Gotham Heights Tours” printed on the side, likely attempting to monetize the chance tourists have of seeing a man dressed in a bat costume go grappling by. Discover why Gotham City is great again when the movie hits theaters March 25th.